Recently at the Loyalty Event in San Diego, Mike Hecht from Delta noted that they don’t mind whether their customers are loyal due to credit card spend, or due to bum-in-seat flying – either way they’re being loyal and should be rewarded with status. This is a slightly different approach to JetBlue, who want their customers to be loyal both by flying and by engaging with co-brand products, according to Whitnee Hawthorne, Manager of TrueBlue Partnerships. They’re both right, but the industry secret they’re not letting on to is that there are many more than 2 methods which customers are being graded and tracked by. There is no one single metric in which to value a customer. It’s actually a balanced scorecard with inputs from all areas of the greater business. Here, I’ll share the data insights and analytics used around customer intelligence and information used to understand how loyalty to frequent flyer programs and airlines is truly measured – with great accuracy. Loyalty professional David Feldman talks about how ‘Airlines are now investing what seems to be the GDP of several nations in mining Big Data’. This couldn’t be more accurate, especially as airlines race to find the next big thing inside their data sets. The magical formulas that will transform revenues into record profits, increase yields, and ultimately foster a new wave of loyalty. This all starts with understanding the customer and their current and potential impact on each individual area of the overall business. 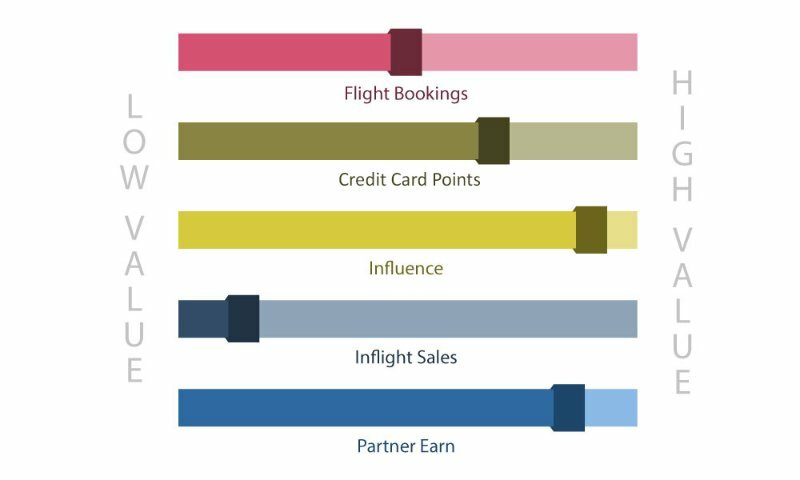 Major global airlines also track your overall loyalty based on a number of factors, with each determining product holding a ‘weighting’. For example if you book a first class flight, it’s clearly worth more as a weighted item than crediting your $100 Hertz rental points to the frequent flyer program. But if you’re sending 1,000,000’s of points from Hertz to your FF account – it’s possible you are more valuable to the program than a mid-tier status member. Each time you, your friends or anyone in your sphere of influence interacts with the FFP, your internal score on how important to the airline can go up and down based on thousands and thousands of factors beyond what you think may be normal. In fact, just because you’re a top status frequent flyer with the airline does not mean you’re the most important customer in their database. The membership card and status you receive from the airline is generally considered what the customer side of the loyalty equation looks like. This is what customers receive and with the status it has associated benefits that are standard. On the FFP side, your loyalty value is more complex, and while you’re seen as a Gold, Platinum etc. – your true ‘status’ within the FFP is based on your influence, contribution and future potential value. For example, let’s say you fly a few times/year in economy – but you just won $10M in the lottery. Some airlines will be tracking this type of activity right now (yes, it happens) and your ‘future potential’ value sky-rockets as you are likely to be blowing some winnings on a ticket somewhere you’ve always wanted to visit. Your value to the airline, for a short time – can be higher than your best friend who is Platinum status and regularly does 50 flights a year. If you were both on the same flight, it’s very possible that you would receive an upgrade over them – despite your friend appearing to have higher status. Aside from the usual metrics such as cost of flight; cabin, destination and how you purchased the flight (Through an agent? In what country did you purchase the fare? Direct with the airline?) 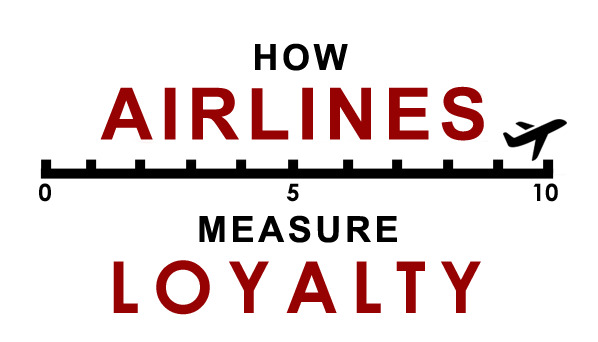 Here are a few methods some frequent flyer programs are using to track your overall loyalty and value to the company. Number of travellers with you:Not only are you shelling out the cash for your own ticket, but there’s your partner, kids and Uncle Jim. It’s your money and you just became worth 4x more than a solo traveller on that flight. Share of wallet on home airline to partners, to non-partner airlines (many airlines have insight to how often you fly on the competition, so it’s no surprise your value to a FFP can change depending on your loyalty). 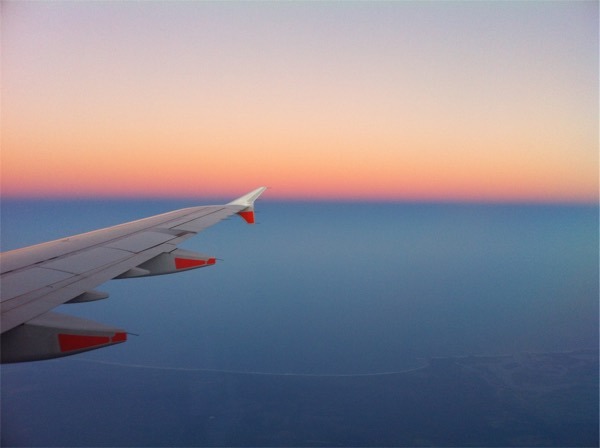 In-flight sales/duty free spend: In-flight sales can be high margins for airlines, and if you’re one of the few who spend money to shop in the air, you’re padding the airline pockets with extra cash and this is activity airlines want to encourage. Your value will increase as a result. Number of credit card points earned: FFPs generate most of their revenue from banks, which comes from the money you spend on your credit card. The more points you earn from credit cards is more cash the FFP has made. It’s a beautiful win: win scenario and in fact some airlines will give you top status based on credit card miles without ever needing to fly! Number of miles used, and how they are used inside the FFP. Not all miles are created equally, just the same as they’re not burned equally. If you’re redeeming miles on toasters, new golf clubs and economy class seats – these don’t necessarily net you the best bang for your buck , but the FFP will give you extra kudos for being silly with your miles burning. Thus, you become more valuable as a customer. Your influence over other people: Aside from the obvious like how many Twitter, Instagram or Periscope followers you have, FFPs are able to disseminate your social graph and who you’re connected to outside of online social media. Is your dad the CEO of a major multi-billion dollar company? Yeah – your value to the FFP just sky-rocketed. Do you generate money for the airlines indirectly? Perhaps your business has a freight contract with the airline, your company spends $millions annually, but you – as the CEO never fly. Your value is still significantly high, despite not directly contributing any revenue to the FFP. Your potential new business: British Airways is rumored to have a Blue Rocket program that can identify customers showing behavioral signs that mean they’ll be on their way up through Silver and Gold status in no time at all. These customers are ones to look after! Media Data: Did you recently purchase a $5M house in Miami? Recently sell a business or have a financial windfall? Chances are you’re likely to travel there more often, and the FFP will know of co-brand opportunities in the local region which may be most utilized by affluent frequent flyers. These are only a small number of simple data metrics and analytical insights that frequent flyer programs use to identify and track loyalty now and predict your value into the future. The actual data models running behind the scenes are complex, yet incredibly powerful when used as part of a larger strategy. When combined as part of the big picture, not only can FFPs increase your loyalty through gaming mechanics, but using the power of data they can make you pay more for flights without you even knowing it. Well don’t expect any change from QF, they don’t give back until forced to. Borghetti at Virgin is more likely to catch on to this than QF. He already allows status credit aggregation, this is just the next step. Its entirely logical of course. QF brags the FF program is the most profitable part of the business but it is totally ignored for status purposes. Great post Mark, I really appreciate your candid insights into the big data of loyalty. I’ve been working with a lot of marketers dealing with big data and my experience is that they are good at accumulating it, but less good at actioning it. For example, when I walk up to the Virgin Australia gate, they don’t treat me any different than they would with Keith or yourself. Not because they don’t want to, rather because where they are great at data, they aren’t as good at connecting that to human interactions. Perhaps the exception here would be with First class customers where they have your profile known to the stewards and stewardesses. Even at this level, I doubt they are passing down genuine loyalty information with a call to action on how to improve the experience. Maybe I’m wrong. Appreciate the kind words Todd! Different airlines/FFPs are in various stages of implementing the use of internal data strategies. For example in USA the major airlines will know when you are flying on a competitor, the share they have of your business from flights etc.. In mature loyalty markets with little competition, the drivers for airlines/FFPs to innovate isn’t as strong as in developing economies – especially as they struggle to link commercial opportunities with the use of data. There’s huge gains & opportunities to be had in this space and as the major players develop more sophisticated tools we’ll begin to see the big guns come out and the real revenue will roll in the front door. Is it really possible to get status upgrades without ever flying, by just accumulating credit card miles? Under the right circumstances yes very possible. Consider this; if you earn 10 million credit card points/year – are you more valuable to the airline than a run of the mill Platinum member who spends $10-$15K on flights? You wouldn’t only be higher value but you would be incrementally more important as a customer to the overall business. Delta for example – you can earn status via credit card spend in USA. Unfortunately the options are limited in Australia unless you’re a big earner. Be what about my giraffe? Really interesting read. Thanks for the insight. This is the most interesting post I have read on this site! Thanks for the feedback, appreciated!